Willie Mae Hicks Keener, daughter of William Gordon Hicks and Olga Nora Ivy and married to George Howell Keener. Willie Mae Keener passed away March 29, 2011 at the age of 83. 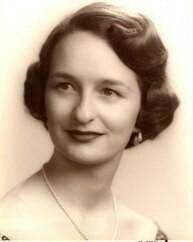 She was born April 25, 1927 in Tuscola, Texas to Gordon and Olga Ivy Hicks. Prior to moving to Houston in the late 50's she lived in El Paso, Texas. Willie Mae was a charter member of the Covenant of Faith United Methodist Church. She was the secretary at Mitchell Elementary School for over thirty years until she retired. She was a loving wife, mother and "Nana" and enjoyed spending time with her family. Willie Mae was preceded in death by her husband, George Keener. Survivors include her son and daughter-in-law, Kevin and Michelle Keener; daughter and son-in-law, Woodie Kay and Jeff Fry; two grandchildren, Jocelyn Keener and Ray Fry; nephew, Duke and his wife, Cynthia Green; niece, Gayle and her husband, Jim Knight; many great nephews, great nieces, other relatives and friends. Visitation will be from 6-8 pm, Thursday, March 31, 2011 at Forest Park East Funeral Home. Funeral services will be at 2:30 p.m., Friday, April 1, 2011 in the Chapel of Faith at Forest Park East Funeral Home with Rev. Luthor Walker officiating. The family would like to express their gratitude to Houston Hospice for the loving, professional care they provided to Willie Mae. In lieu of flowers, memorial contributions may be made to Houston Hospice, 1905 Holcombe Blvd., Houston, TX 77030 or visit www.HoustonHospice.org.